THE HOLLYWOOD SHORTIES is a documentary on the birth of organized sports in the American dwarf community. 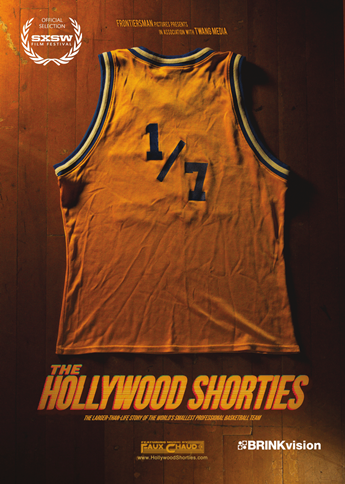 Beginning in the 1950's and rising to prominence in the 1980's, the Hollywood Shorties were a basketball team, the first of their kind and unique in the history of dwarf athletics. Formed from an insular community of recognizable-but-typecast actors in... wait for it... Hollywood, the team began simply as a rare outlet for little people to gather publicly. As the team's athletic skill increased, so did its membership and so too its popularity. By the early 1980's, the Shorties had created a niche in entertainment akin to the Harlem Globetrotters, playing exhibitions from Hawthorne High to the Fabulous Forum with their signature blend of comedy and basketball prowess. Simultaneously, they found themselves the vanguard of a revolutionary movement to bring little people into the public eye as something other than objects of curiosity. But, in a bittersweet turn, the very popularity that the Shorties single-handedly created would eventually phase the team out of the sport they pioneered. However, their legacy stands without peer and is recounted here by original team members and the generation they inspired.